$270.00 plus $15 shipping and insurance within the Continental United States. For local sales, shipping charge will be allocated to NYS Sales Tax. Please email me at JamieWG@aol.com for International purchases or with any questions. 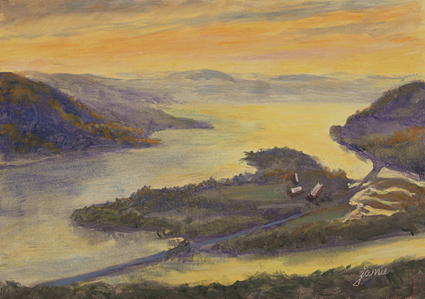 This painting depicts the soft, colorful skies over the Hudson that I was treated to during one of my visits to Olana, home of Hudson River School painter Frederic Church. Have you been wondering what to give that Special Someone for Valentine’s Day, which is just around the corner? 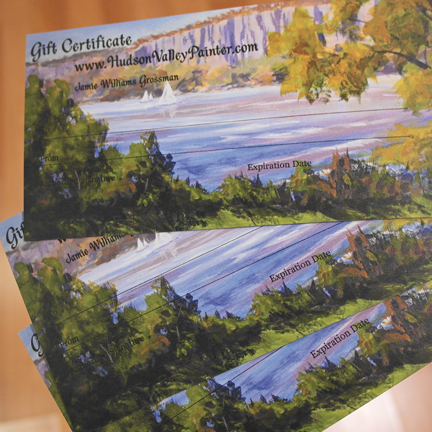 How about a gift certificate to Hudson Valley Painter! The recipient can come to the website and make their own selection, or arrange for a commissioned piece. Email Jamie at JamieWG@aol.com if you’d like to order a gift certificiate. 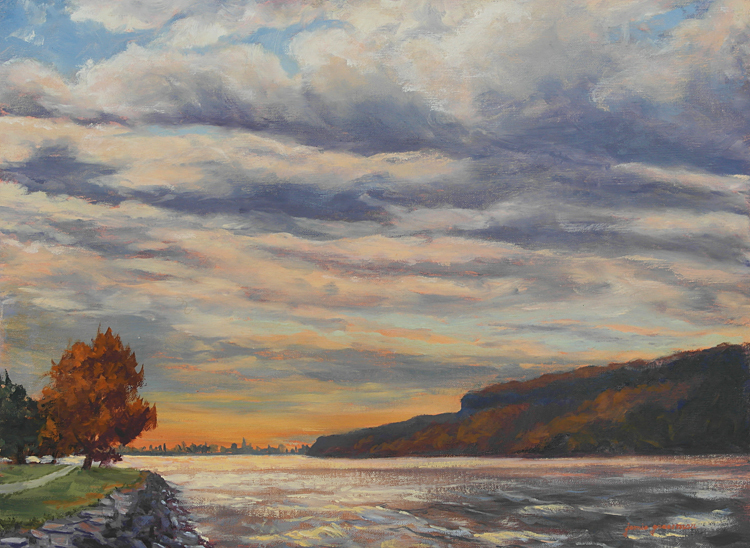 There is a park along the Hudson River in Irvington, New York, which has nice views of the New York City skyline. A client suggested I check it out, so I went with my camera one extremely windy, cold autumn day. It certainly wasn’t the kind of day I’d want to be out painting along the river! However, there were wonderfully dramatic skies and choppy water reflecting light from the breaks in the clouds. The spray flew up in all directions, and I nearly got soaked out there just taking pictures! This painting was done from references obtained during that expedition. $135.00 plus $12 shipping and insurance within the Continental United States. For local sales, shipping charge will be allocated to NYS Sales Tax. Please email me at JamieWG@aol.com for International purchases or with any questions. The other day, I posted a painting done from Bear Mountain, overlooking this same view of Iona Island and the Hudson River. The challenge I faced on that one was the quickly changing light very early in the morning. I was so determined to capture the strong yellow glow before it vanished, that I went back the following day. 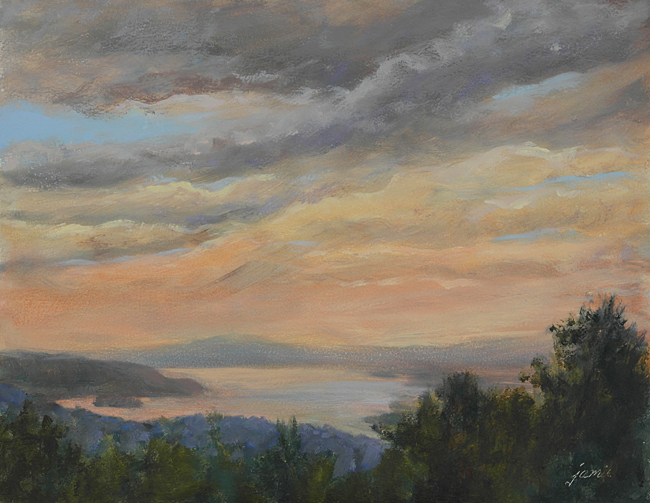 I arrived very early and pulled out this small panel, covering it with the transparent yellow that washed the scene, and painting into that until the sun came up higher and the color again disappeared. Once that happened, I stopped and put it away so that I could finish it in the studio, and keep the concept intact. I tried to keep the painting as transparent as possible, using very little white to maximize the glow through the paint layers. This painting was started early one morning up on Bear Mountain, overlooking the Hudson River and Iona Island. The strong, early morning like lit up the river, and the island and mountains were all silhouetted. As I worked and the morning wore on, that colorful, angled morning light gave way to a different scene. Much as I initially intended to hold onto what I started with, I found myself changing the character of the light for a different, though still beautiful interpretation of the scene. 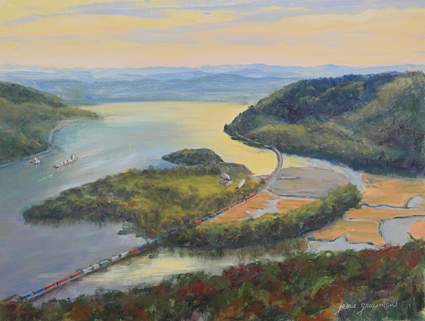 I went back the following day to finish it, and caught the barge and tug going by, as well as the freight trains crossing over the bridge from the island. The box cars provided some great pops of color! 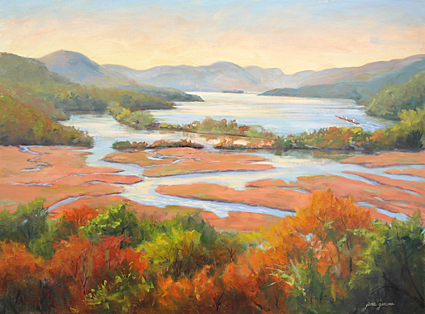 Few scenes are more striking that the autumn colors from Boscobel, overlooking Constitution Marsh, and the Hudson River, with the downstream vista of the Hudson Highlands in the distance. I paint it a few times a year and it never gets old for me! This 18×24″ version was just finished up in the studio, since I was a little short on time out on location.